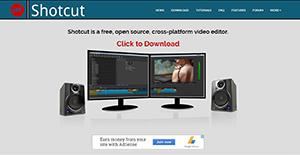 Shotcut is a free and open-source video editing and encoding software that is available for Windows, Mac, and Linux devices. The platform works with resolutions as high as 4K and has a broad format support which highlights its impressive capability. Although, the program is not as professionally and intuitively presented as its competitors, beneath its rough appearance lies a powerful program. It’s an ideal solution for enthusiastic filmmakers thanks to its array of editing features and audio/video effects. It’s not the most beautiful software available, but you will find little or no culpability in its functionality. Some of the features that make Shotcut a top-notch editor include: Wide format support, multiple audio features, video effects, editing features, cross-platform and codec independent, display and monitoring, and hardware support. Shotcut is a reliable, cross-platform video editor that makes editing task simple and effective. Its open source nature means you can alter its source codes to create a high-quality, easily integrated, and secure application. The software is also free, but that doesn’t mean it compromises the basic editing features. It comes with all the tools of a classic video editing program, plus a host of other options that bring it up to date. Its interface is well laid out to bring the efficiency refinement of features scrutinized by many hands. The preview panel offers a gateway to the quick start guide while the view menu gives you the control over the features displaying on your screen. Its set of features is impressive, but the highlight is innumerous audio and video filters. The filters are fully customizable and can be combined and layered in a raft of interesting ways. Making adjustments is super easy thanks to the straightforward system of sliders and checkboxes. The system is brilliant enough to make the advanced effects easy to understand. The software is expertly built for a wide format support. Its FFmpeg enables the platform to support hundreds of video and audio formats and codec. It also supports the most popular image formats like GIF, PNG, JPEG, TGA, SVG, TIFF, BMP, plus image sequences. Its native timeline editing eliminates the need for importing media files. In addition, the multi-format timeline allows you to mix & match frames and resolutions within a single project. If you are considering Shotcut it may also be sensible to analyze other subcategories of Best Video Editing Software gathered in our database of B2B software reviews. There are popular and widely used systems in each software category. But are they necessarily the best fit for your organization’s unique wants? A popular software application may have thousands of subscribers, but does it present what you need? For this reason, do not blindly shell out for popular systems. Read at least a few Shotcut reviews and mull over the factors that you want in the software such as the price, main features, available integrations etc. Then, choose a few systems that fit your requirements. Try out the free trials of these apps, read online comments, get information from the vendor, and do your homework meticulously. This in-depth research is certain to aid you find the best software solution for your firm’s special requirements. How Much Does Shotcut Cost? We realize that when you make a decision to buy Video Editing Software it’s important not only to see how experts evaluate it in their reviews, but also to find out if the real people and companies that buy it are actually satisfied with the product. That’s why we’ve created our behavior-based Customer Satisfaction Algorithm™ that gathers customer reviews, comments and Shotcut reviews across a wide range of social media sites. The data is then presented in an easy to digest form showing how many people had positive and negative experience with Shotcut. With that information at hand you should be equipped to make an informed buying decision that you won’t regret. What are Shotcut pricing details? What integrations are available for Shotcut? If you need more information about Shotcut or you simply have a question let us know what you need and we’ll forward your request directly to the vendor.